Three amazing effects. One professional grade routine... This is The Triple . If Triumph, The Collectors, and a color changing deck effect all got together and had a baby, it might just look something like The Triple . 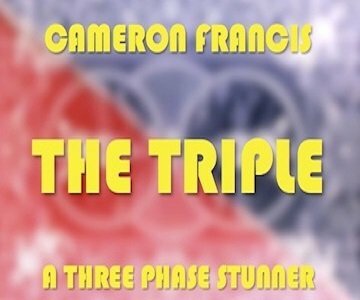 Cameron Francis delivers another knockout multi-phase card routine that's truly amazing to witness but devilishly simple to execute. No gimmicks. No difficult sleight of hand. Just a truckload of powerhouse magic. Perfect for the professional or hobbyist. The Triple builds steadily and delivers a serious kicker ending. This is commercial close-up card magic at its very best - and it's all-new! Stop!..watch every bit of the handling several times before tossing this aside as being involved or difficult. IT IS NOT. The routine is a masterpiece of constructed sequences which is SIMPLE..hard hitting and a working mans dream.